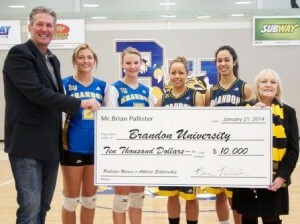 BRANDON, MB – Brandon University (BU) is pleased to announce the creation of a new scholarship for female athletes, through a $10,000 gift by BU alumnus Brian Pallister, Leader of the Progressive Conservative Party of Manitoba and Member of the Legislative Assembly for Fort Whyte. The Pallister Women’s Athletic Scholarship will be awarded to a member of one of the Bobcats Women’s teams on the basis of athletic promise. 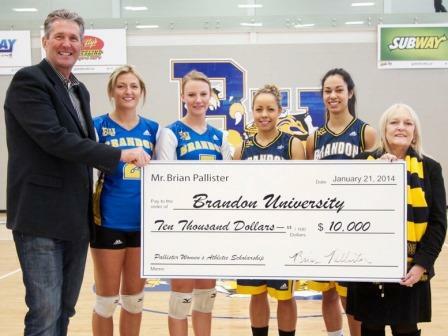 Mr. Pallister’s donation is being matched by Brandon University, through the Manitoba Scholarship and Bursary Initiative, generating a scholarship of approximately $900 per year beginning in 2015. Each year, Brandon University gives scholarships and bursaries to students in excess of $1.2-million, thanks in large part to legacy gifts and new contributions by alumni, students, staff, faculty members, community-minded individuals and corporate sponsors.